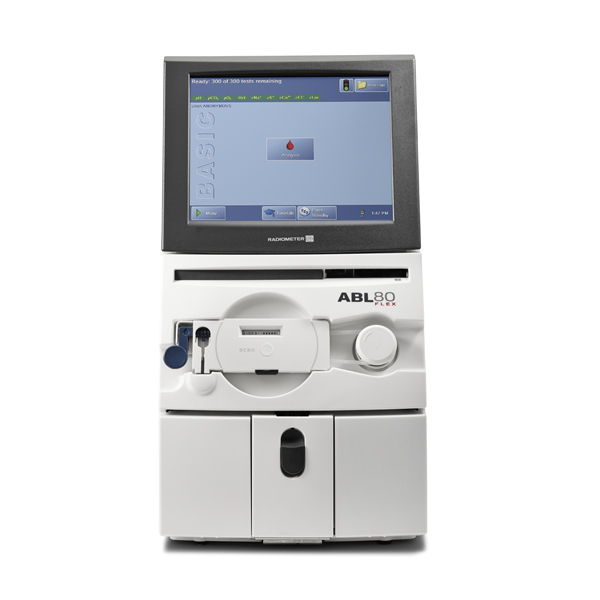 Cost-efficient blood gas, electrolyte and lactate analysis Compact and reliable, the ABL80 FLEX analyzer – BASIC version is the ideal cost-effective choice for blood gas, electrolyte and lactate analysis. Its standby mode reduces the costs for consumables while the analyzer stays ready for the next patient sample. Replacement of consumables involves simple steps as few as 6 times a year, reducing time spent on maintenance. With its small sample volume, portability, rapid start-up and easy sample handling, the ABL80 FLEX analyzer – BASIC version is the ideal blood gas analyzer for smaller clinics and hospital departments. The ABL80 FLEX analyzer – BASIC version offers full IT connectivity to the AQURE point-of-care management system*), and can be used as a part of Radiometer’s 1st Automatic solution.